A common type of New Age practice which many people find themselves exposed to through chiropractors, nutritional counselors, and herb salespeople is “kinesiology” or muscle testing. There are several forms -- AK, Behavioral or Bio-Kinesiology, MRT, Contact Reflex Analysis, etc. These should not be confused with physiological kinesiology, the legitimate study and science of muscular motion. Variations of Goodheart’s kinesiology use the deltoid muscle or finger muscles as the testing muscles. Using the deltoid muscle to test, the arm is held out parallel to the floor and pushed down by the practitioner against the resistance of the client to check the body’s response to a variety of substances, objects, and or even thoughts. When the fingers are used the practitioner checks the client’s response by pulling apart a thumb and finger. The substance being tested is held in the other hand or placed under the tongue while the test is being done. Checking for organ or system weakness or vitamin or mineral deficiencies is done with the practitioner or the client (depending on which authority is being used) touching key “trigger” spots on the body when the test is being done. Perceived strength or weakness of muscle response is used to determine the prescription and dosage of herbs, natural vitamins and foods, as well as to diagnose allergies and to identify stress factors -- telephones, for instance. In cases where the client is not fully able to cooperate -- a small child, an elderly client, a comatose client, or an animal, for examples -- kinesiologists advocate using proxies (“surrogate testing”). It is claimed that a “balanced” surrogate receives and transmits the client’s energy balance and corrections simply by contact with the client and practitioner simultaneously. The explanations for these and associated practices may be garbed in scientific sounding words, but scratching the surface slightly reveals the origin and metaphysical theory beneath. In John Diamond’s Your Body Doesn’t Lie the explanation of kinesiology starts with a description of “Universal Life Energy,” crosses over to the undetectable Chinese energy meridians, moves into the “electrical depolarization” of ch’i traveling along the fibers of the autonomic nervous system to the muscles, and translates into “electromagnetic” energy, all without batting an eye, and with no explanations of the equations. This is the same energy which Hindus claim to inhale as “prana” from the universe and which others claim to manipulate with the hands or mentally transfer. Diamond, a Charter Diplomate of Goodheart’s International College of Applied Kinesiology, quotes from occult writers in his book, including master occultist Manly P. Hall. In demonstrating how muscle response testing worked a nutritionist thought a particular thought about a client, and then checked the client’s fingers for the response to this “positive energy transfer.” The practitioner’s positive thought supposedly led to “strength” in the client, “validating” that procedure, and thus other practices. If the suspicion of the practitioner about the client’s condition involves an unhealthy possibility (cancer for instance) this technique may also be used instead of verbalizing the inquiry to the “body wisdom” and upsetting the client. This represents attempted telepathic communication. 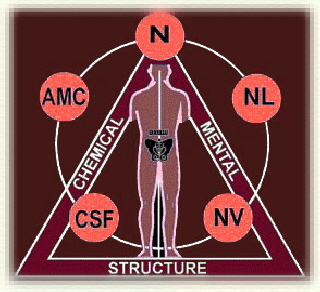 While this “thinking” of the question so as not to influence the client, (especially by providing negative information,) is done, in most examples of this New Age kinesiology the practitioner speaks during the procedure, asking the “body wisdom,” the “energy,” the Being, the “subconscious,” the Divine Within, the Innate, or some other similarly identified entity somehow different from the client’s actual person to provide information about the client. The implication is that there is something existing apart from the person which can be addressed and influenced through “applied kinesiology.” Given the popularity of this practice in certain evangelical Christian circles, one wonders how this concept is integrated into the orthodox Christian understanding of the nature of the human being and the existence and nature of other beings. Another reference is found in an attractive book entitled The Perelandra Garden Workbook: A Complete Guide to Gardening with Nature Intelligences by Machaelle Small Wright. Muscle response testing is described for use in assistance while gardening. By asking questions with “yes” or “no” answers and checking one’s own finger resistance, information can be obtained about thorny gardening questions. The inquiries are made to the “devas” -- the gods/spirits -- the “nature intelligences” -- who inhabit the garden. Their responses supposedly will alter the electro-magnetic environment of the questioner’s body, affecting the muscle response. New Age kinesiologists claim the energy emanating from herb and vitamin capsules, objects or even thoughts somehow balance (or unbalance) the body energy. This is closely connected with the occult concept that all objects, including foods, have different “vibratory rates” or energy which affect the “subtle energy” of the body to a very significant degree. The occult world view teaches that we can uncover hidden information about how to discover and control these energies. The evidence for and the significance of these beliefs cannot be substantiated in studies of the anatomy and physiology of the human body and the natural sciences. For example, a 1988 study tested the claim that muscle testing can determine nutritional needs. Comparisons between kinesiologists, with standard biochemical tests, placebos, retests, and a computerized dynamometer to measure muscle strength, indicated that kinesiology is no more useful than random guessing to determine nutrient status. (Kenny, “Applied Kinesiology Unreliable for Assessing Nutrient Status,” Journal of the American Dietetic Association, 88:698-704, 1988.) No well designed studies in reputable journals were found which validate the claims of applied kinesiology and its offshoots. As an anecdotal antidote to many of the success stories offered to validate this practice consider this one. At a 1994 alternative health fair in North Carolina a woman was tested using muscle testing and found simply to have weakness in her kidneys. It should be noted that this woman has numerous serious health problem for which she receives treatment including rheumatoid arthritis, asthma, fibromyalgia, insomnia, bursitis, irritable bowel syndrome, with a history of gall bladder disease (it was removed) and hysterectomy. This result could be attributed to the poor technique of the tester(s) but it should be noted that a highly accredited and experienced iridologist also missed everything. Applied Kinesiology and its offspring are a form of metaphysics and also need to be evaluated from that standpoint. The explanation offered for the mechanism of kinesiology by the kinesiologists is the rather broad description “energy.” While presented as “electro-magnetism” in an attempt to sound scientific, it is clear from the common sources and uses that the line between pseudoscience and the psychic is blurry, if indeed it exists at all. In fact, in researching applied kinesiology William T. Jarvis, Ph.D., Professor of Preventative Medicine and Public Health at Loma Linda University Medical School, questioned a major proponent about how the complex relationships between nutrients and herbs, body organs, teeth, energy meridians, and muscles were determined. George Eversaul, author of several kinesiology books, stated that George Goodheart was psychic and developed his charts by that means (5:310, personal communication). There is in fact, no standard for the energy manipulator/kinesiologist to measure his practice against. The very precepts he bases his practice on are occultism and pseudoscience. Those precepts are poorly described and are unmeasurable, leading the practitioner into deeper dependence on magical thinking misnamed as science. For the professing Christian involvement is like spiritual quicksand which pulls one away from the Biblical absolutes into dependence on manipulation of mythical power for hidden knowledge. The Word of God is clear about God and His relationship to His creation. We are separate, not the same in essence or “energy.” The power and knowledge (real or imagined) to alter someone else’s “energy field” is not Biblical Christianity, but quackery and/or occultism, no matter how nice the practitioner is. Diamond, John, Your Body Doesn’t Lie (New York: Warner Books, 1979). Donahue, Joseph H., “D.D. Palmer and the Metaphysical Movement in the 19th Century,” Transitions, Vol. 13, No. 2, pp. 16-20. Kenney, James J., R. Clemens, and K.D. Forsythe, “Applied Kinesiology Unreliable for Assessing Nutrient Status, “ Journal of the American Dietetic Association, Vol. 88, No. 6, June 1988, pp. 698-704. Miller, R. Michael and Josephine M. Harper, The Psychic Energy Workbook (Wellingborough, Northamptonshire: The Aquarian Press, 1986). Pollack, Robert L., and Edward Kravitz, Nutrition in Oral Health and Disease (Philadelphia: Lea and Febiger, 1985). 6. Reisser, Paul, Teri Reisser and John Weldon, New Age Medicine (Downers Grove, IL: InterVarsity Press, 1987).
. Thie, John, Touch for Health (Marina del Ray, CA: DeVorss Publishers, 1973). 8. Wright, Machaelle Small, The Perelandra Garden Workbook: A Complete Guide to Gardening with Nature Intelligences (UK: Perelandra Std, 1987). ©J.A. Lyons 1992, All rights reserved. May be reproduced in its entirety with attribution.